James Michael Curley was born 116 years ago. There were many celebrations and commemoration ceremonies on the centenary of his birth in 1995 in America. The centenary of the birth of this man who was once described as “the greatest political bandit in American history” went unnoticed in the village of Oughterard. 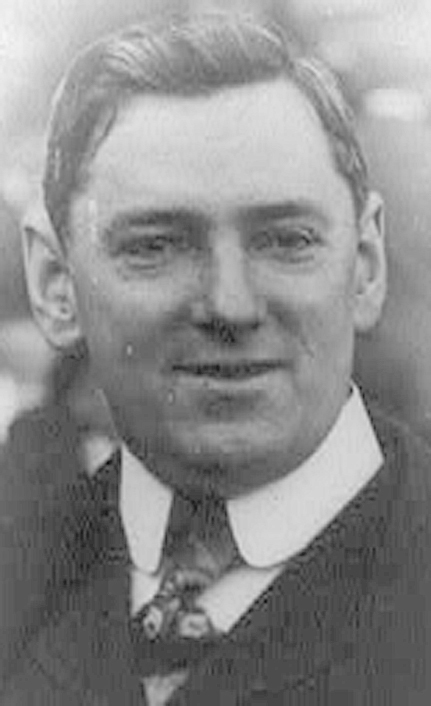 James Michael Curley was born in a tenement house in Boston. His father and mother had come there from Oughterard. They were born around the time of the Great Famine (1845-1847) and set sail in an emigrant ship to Boston in the eighteen sixties. His father Mike was only 14 years of age then and his mother Sarah Clancy, was not yet a teenager. Mike Curley was a strong lad and he soon got a job carrying a hod. He worked 10 hours a day for 10 cents. By the time James was born his father moved up in the world, he had got a job in the paving department and was earning better money at this. The job, though, was to be the cause of his death. He had taken a bet with the other workmen that he would lift a 3cwts stone off the ground. He did, but he collapsed on top of it when he let it drop and died three days later. James was only 10 years of age at the time. The family were left penniless and their mother had to go out scrubbing floors, James’ formal schooling came to an end when his father died but he went to night school and studied hard. He started off selling papers and, at 12 years of age became a messenger boy as well. At 20 he was clerk of a bakery supply store. He joined the Ancient Order of Hibernians around this time and they pushed him into politics. It was the start of a career in which he was going to make a name for himself in earnest. In 1903, he was elected a member of the Massachusetts Legislature. Soon after this he was convicted for sitting in the place of another at a civil service examination and was sentenced to two months imprisonment as a result. He wasn’t worried. “He was my friend; I did it to help him,” he said. The Irish were behind him after that. His action had caught their fancy. He wasn’t afraid to speak up in Boston at that time where notices for jobs were often accompanied with the stark reminder that “No Irish need apply”. He was elected Alderman after this and was continually in the headlines afterwards. He was elected Mayor of Boston in 1913 and, you could say, really made his career. He was in and out of office for the rest of his life. He was elected to the United States House of Representatives four times. He was elected Governor of Massachusetts when he was 60. In all, he fought in three campaigns and lost about a many as he won. 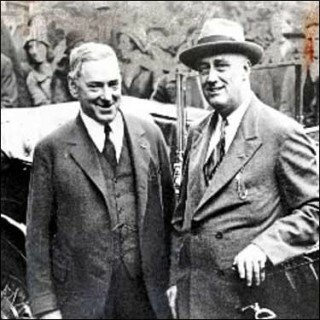 He backed Franklin D. Roosevelt for President. He hoped to be made ambassador to the Vatican as a reward for his help. FDR offered him Poland instead. Curley wouldn’t have it and went out and won the State Governorship instead. His greatness was that he was able to bounce back from defeat. FDR’s “New Deal” made this more difficult as it took over the care and feeding of “Curley’s Brigade”. In 1949, he was eventually swept out of City Hall for good. He tried three more times but failed in his last try, he was even ousted out of the runner-up position for the first time. James Curley was a devout Catholic. He had a lot of personal misfortune during his lifetime. Seven of his nine children died tragic deaths, two within fourteen hours of each other. His first wife died of cancer. Bostonians got very fond of him as he grew older; he was no longer a treat to his enemies then and they had a soft spot for the old campaigner who certainly brightened their lives. There are a lot of stories told about Curley, all probably true. These helped to make him the great character he really was. When he was only 15 he decided to leave the job he had. Before doing so, he flung a bar of soap at the manger who, immediately, offered twenty dollars to anyone who would tell him the name of the man who flung the bar of soap. “Make if fifty and I’ll tell you”, Curley told him. He got his fifty, owned up and was fired. While he was Governor he went around in style. He could charm any audience as he did at a reception in Harvard one time. Later that same night when he got around to making his speech he started off as follows; “ Fellow pickpockets, doormat thieves, lush rollers, baby snatchers, bottle robbers – you see, I know all”…. Curley had a great admiration for Mussolini. He visited him once and presented him with a blackthorn stick. “I come, Sir, to present you with the symbol of authority, the chief weapon of my ancestors,” he told him when making the presentation. He was a great man to have the apt word at the right time. Edwin O Connor wrote a novel called “The Last Hurrah” which wasbased on Curley’s life. It became a best seller and there was a film made of it with Spencer Tracey playing the part of Frank Skeffington. Curley accepted the fact that Skeffington was meant to be himself. He was awarded 15,000 dollars in an out of court settlement on the film. Curley said that the film was an invasion of privacy. He enjoyed being in the lime light once more as a result of the book and film. One hundred thousand people filed past his coffin. James M. Curley died on the 13th November 1958. His Jesuit son, Father Francis, gave him the last rites. The undertaker dressed him up in his morning coat and grey trousers which he always wore on big occasions. One hundred thousand people filed past his coffin. His son celebrated his funeral Mass which was presided over by Cardinal Cushing, who was made cardinal a few days later. 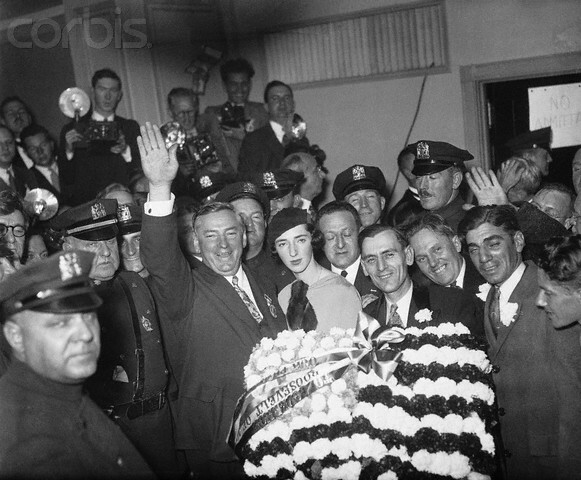 The funeral was the great event that Curley would have wished it to be. The only thing that was missing was that there was no eulogy – this was in keeping with the diocesan practise and I have no doubts but James Curley would have settled for Frank Skeffington’s eulogy in “The Last Hurrah”. James Curley got all of these. He had a good innings. God rest his soul. Note: This article appeared in the “Oughterard Newsletter” October 1995. The article was brought to the attention of the editor by an Exile. The ruins of James Curley’s ancestral home is in the townland of Canrawer, Oughterard. According to the records our Heritage Group have, James was born on November 20th 1874. He was elected Mayor of Boston on three occasions from 1914-1918, 1922-1926, 1930-1934. He was also Governor of Massachusetts from 1935-1937. He was convicted of Mail Fraud in 1947 and pardoned in 1950 by President Truman. This page was added on 09/03/2011.